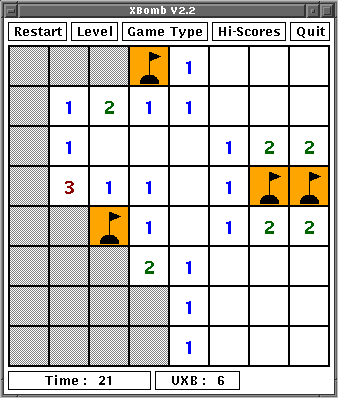 This is a version of the minesweeper game for X Windows. Why XBomb not another version? Have you ever played minesweeper on a grid that is other than square in shape? Try playing on a hexagonal grid or for a challenge on a triangular grid. There is a high-score table for each of the sizes of each of the types of grid. 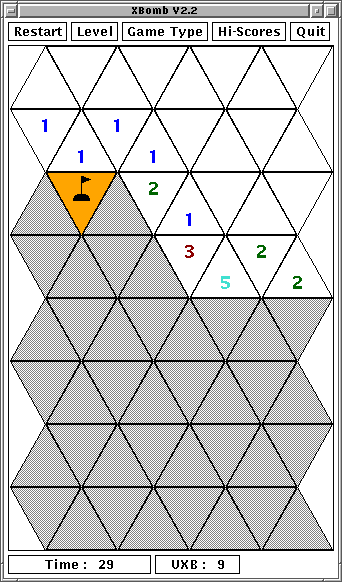 This is the easiest of the three grids, although the endgame can be impossible. There are 6 neighbours to each of the tiles. This is the traditional grid shape. There are 8 neighbours to each of the tiles. This is the most difficult of the three grids by a long way. There are 12 neighbours to each of the tiles. The latest version of XBomb is version 2.2b. 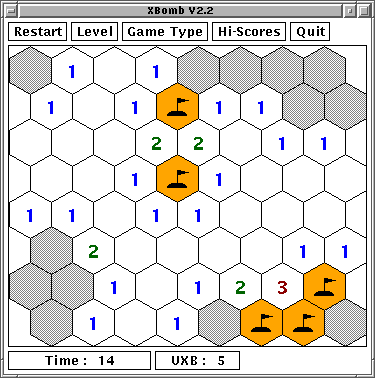 After 9 years without modification version 2.2 adds different colours for the different numbers and the ability to use just the left button to clear areas marked as free of mines. After another 5 years a change of website address and a bug fix make it time to release version - 2.2b. The source code for the versions listed above are in the download directory. The complete source code history can be browsed in the Subversion viewer which also has a list of the latest changes. Formal releases which are the traditional method used for this software with version numbers like 2.2b. These will continue to be released when there are major changes or important bug fixes and each release includes full updates for release documentation. For these releases announcements will be made on this web page and with a new file in the download directory which includes an RSS feed for notification of new files. Informal, intermediate, releases which have not previously been used for this software and will have version numbers like 2.2b-svnxyz. These will be used for small bug fixes or minor improvements to functionality. For these releases there will only be the software and directly related documentation changes, not a complete release documentation update. These informal versions will only be available from my new web site download directory and included in the RSS feed found there. I am happy to answer questions that you have about the program, just drop me an email to the address at the bottom of the page; don't forget to put xbomb in the subject so that it ends up in the right mailbox.